I have decided to make more of the coral variations- as editions much as you would lino-prints on paper- only difference is these have individually painted/transfer dyed backgrounds and are individually stitched. I coloured the background lutradur in these and like the variation in colouring this provides. These are also for sale for $50 US inclusive of postage. The variation from the day before yesterday is sold and there is a hold on the reddish one from the previous psoting of 3 variations. As many of you know I live in the Otway Ranges in Victoria- an area which is one of the last reserves of semi-tropical rainforest in the world.It is the home of unique fauna and flora amongst which the platypus which is one of only two species ( the other being the echidna) that lays eggs yet suckles its young. It lives in the Gellibrand River and the creeks of the area. The animal is extremely shy ,and last year the Chief Sheik of the United Arab Emirates brought his family to enjoy the privilege of swimming with these creatures and observing them in their habitat near Forest.The whole ecosystem is in precarious balance as many of mans activities have impacted on habitat, water and climate and then there is the ever pervasive risk of fire in the summer months- add to this several drought years that has seen a lowering of the water table and you will see there is a need to protect this precious place. Much of this is subject to discussion and often standoffs between the different interests which exist in any community. However there has been one issue that seems to have galvanised everyone to express protest and has seen a willingness of different interests to work together to protect our most valaubale resoure- water. It has been proposed by Barwon Water to pump the Aquifer ( artesian water) in this region in order to supply greater Geelong and Melbourne. Everyone is aghast as the water table is in a precarious situation, but not only that it appears that no environmental impact studies have been done. So in the light of this members of the community have been working together to stage protest, to question and to activate the community.Recently a surprisingly large meeting was held in Gellibrand Town Hall to question Barwon Water and since then members of the community have been organising action.This weekend we printed t-shirts with a logo designed by another community member who chose the platypus as the symbol of protest. We have also set up a blog which we will fill with photos of the region, information on the region, its fauna and flora. And as an aside I think it is criminal the size of the houses they are permitting to be built with often not two but three or four bathrooms. Cities waste huge amounts of water and really ought to give some thought to the impact of that use on systems outside of their immediate surroundings.Australia is a dry land an extremely dry land and water is not an endless resource but a precious thing that needs to be used carefully. So no aquifer pumping! I had intended to make quite a few more of these coral variations but unfortunately my machine is playing up and I only got this one done.It is a hassle as it is the same problem it had last time I had it seen to and that took more than three weeks to fix, because the service centre is so busy . I can't afford to be without my machine that long this time.I wanted to make these pieces to try and get together money to try and get to Europe for January where I have workshops organised. The red coral variation from the previous post is sold.The second photograph shows the transfer dyed lutradur.I also wanted to make more pomegranate cards and printed the fabric this morning- but they need to be stitched. My contract with Editions de Saxe for a French version of a coloured 72 Ways Not to Stipple or Meander will go ahead but because the company has been taken over the timeline has been changed. I had hoped to have had part of my advance for publication by now as I have completed all the work and delivered it in September and delivered further drawings about a month ago.I am not sure when it will actually get published now either. I retained the rights for the english version until such time as they decide to publish it in English- but the english version is based on the black and white quilt and is available form me. I finally got out my machine yesterday- it has been nearly a month and I could simply not face it ( though I did do a bit of sewing on the machine I have my eldest daughters room- just straight seams). I had previously painted the transfer papers to print onto lutradur, and I finally did the transferring today, then decided I may as well do a bit of stitching. These are coral variations. I have made a lino cut and then transferred the print onto lutradur. I still have to do some of the satin stitching edging on two, but I am always surprised how different they look depending on the background fabric and colour thread you use. These are for sale and measure 8 3/4 inches square( 22 cm square) and cost $50US inclusive of airmail postage. We are off and running with our Expressive Books group- and will set up a public blog once we area bit further along. But as part of my catalogue/ideas I have been playing around with images from Syria which I took earlier this year. This one is of the big dome of the Khan Assad al Pasha ( where the Across Australia exhibition was also shown in 2006).It is an old caravanserai from the eighteenth century and has been restored so it is in fabulous nick. My daughter and I saw some whirling dervishes there as well. I have played around with my photo in photoshop- not altering the photo a great deal, but playing around with filters and then I printed it on my printer after having previously painted fabric with Matte medium from Inkaid.However I purcahsed mine from Zijdelings in Tilburg in the Netherlands.This stuff does alter the hand of the fabric and I am yet to try sewing it but the image is so well defined and the colour so good I am prepared to sacrifice some flexibility of the fabric. And Sue asked in the comments and seeing I am editing I thought I would answer here- I do back the fabric with freezer paper, but I have to say my printer is also a little sensitive to this sort of stuff so I take extra precaustions.I really like how clear the print becomes. Kathyanne White uses it in some of her work too- and it is worth having a look at her blog and website if you are interetsed in trying different mediums on fabrics and papers- and take a look at her hand made books as well! And there is a blogreader form the Netherlands Antilles- I would love to know if you are a quilter? And for some reason Neoworx does not seem to recognise Lebanon as a country- I have someone who visits from time to time- but whilst sitemeter notes it Neoworx doesn't. Thank you for all the complimentary comments about my mind map- I suppose I have always doodled so it seemed only natural to combine the two things. Doing it this way made me also think harder about what I might find visually in the ideas I wanted to work with- some will happen and some will not and yet others will use theideas as jumping off points. With that in mind i wanted to make some of the patterning of the bottom left hand corner of the map which is actually the pattenring of the cloak of Ibbit Lim of Ebla which dated from 1900BC. I must admit I just love the depth of history in a place such as Syria- and yet the patterns are still relevant today.I also liked that the clothing/cloaks of the time were so highly decorated, I can only imagine how beautiful they might have been. I did this patterning with breakdown printing- though I disappointed myself with being too rough in creating the patterning when painting the screen-in fact I nearly washed the screen- and then decided I may as well print with it to see what it would bring- going by the theory there is no such thing as a failed bit of dyeing.I do want to do the patterning again with a squeeze bottle so I can refine it better- but on the other hand once this was printed it was more interetsing than the painted screen might have suggested. I have been creating a mind map with ideas for the work I want to create for my exhibition in Munich next year. I have decided to go with things relating to Syria- because the experience I had there was enriching and the textiles gorgeous. I also loved the layers of history, the myths, the legends, the architecture ( and I left a french book on Damascus at my aunts... i need it). I also want the map to be part of the catalogue I hope to create to go with the exhibition. Now I shall have to mosey on and dye some fabric- I especially liked some fabric I encountered in the Damascus msuem which dated form Roman times- it was indigo and red with ecru resists of some sort - though the fabric did appear to be painted-- I would love to have photographed it. The weekend before last we had a deluge of rain which caused the Gellibrand River to rise dramatically. A few days ago when I took my daughter for her driving lesson we went and looked at one of the camping grounds on the river and found this lovely tree fern. I love the fronds as they begin to unfurl- there is something really magical about them. I tried some more breakdown printing yesterday - this time on silk, and the printing paste was thinner, so it bled more. Someone asked how I got the rust effect- it really was just the combination of colours- which I painted on the screen and also dripped a layer on which I allowed to run- so I started with golden yellow , turquoise, and a reddish orange, the drips were in black and then I printed with golden yellow dye in the paste.Because I left it outside overnight the blue that is in the black mix bled into the rest of the dye so this was an accident as I forgot to bring the fabric in. I have been doing some more breakdown printing- part of the problem has been that the print paste has not been quite thick enough so that it spreads when painted on the screen. I may have to invest in a blender to get the right consistency. Oh and a little tip if you add a couple of drops of methylated spirits to the print paste it will keep indefinitely if stored in a cool place. I also accidentally left this piece outside last night so that the dew really got to it and it actually caused some very nice bleeding which I have accentuated with some over painting. This piece reminds me of rusted metal not unlike the piece I picked up on the beach at Porto San Giorgio in Italy. I can see some stitching goning into the flat mossy green areas- at the moment I am still procrastinating colour of stitching. It was a stunning summery day today- I must admit I love it when the weather gets hotter . I mowed the lawn first thing- or when the grass had dried off a little- we have a lot of grass to mow as we have 2.5 acres ( a hectare) and we have had a lot of rain recently so that grass has grown a lot. And with summer comes the lizard and snake season so all the more reason to mow the grass- at least you have a chance to see anything scarey then. I found these three lizards engaging in goodness knows what under an old fashioned rose I have . There used to be only one lizard which we would encounter regularly but they seem to be multiplying. They say when you have blue tongue lizards the snakes keep away but I am not so sure about this as I remember snakes and blue tongue lizards from my Jerilderie days and tiger snakes took no notice of the lizards whatsoever. On the second photo you can see a bit of blue near the lizard's mouth as it is biting the other lizard- that is it's tongue hence their name. As you can see from the dyed silk, my dyes have arrived and I can feel myself getting enthused again for colour.I have tied the silk which is 12mm weight habutai with rocks and then painted on several colours.I am thinking of selling pieces worked in this way but arriving at the right price is a bit of a problem as they are quite labour intensive. The "painting" on the half fortyfour gallon drum appeared by itself. The drum had been cut in half to accommodate a fire to sit around at night- and this image emerged- there is something very comforting about it. To all that responded to my challenge of sorts there is 15 of you from all over - can I ask that you email me ( 3 of you have already) so that I have a record of everyone.Some of you already have quite well developed ideas, others need to begin. I always find charting a useful way to work with ideas- so on a blank piece of paper- think of an idea you would like to work with and then write down associated ideas that arise from that idea- ways you might work, associations, alliteration, artists who have worked with the idea, history,aculturation- creating a map of sorts- this idea also comes with other names ( mind mapping for instance)but I actually find it useful to think of as a map/chart- we are visual artists after all- in that way you can make the idea an island or a cosmos of its own- and of course we will be exploring as well.You may find it useful to have a blank A4(legal) paper size journal, or other art journal to work in with conjunction with the actual book you will be making, to record, to store, to experiment and to research.This will be the beginning. You can work in cloth and/or paper whatever you wish- for myself I will be using both from time to time and I love soft cover books and I have been using momogami papers which I have sewn and stabilised with cloth to make covers- but more on that later. I intend to write a bit of structure for those involved- like a beginning middle and end, types of materials you may need ( but I bet most of you have these already and probably some I don't have already! )- and as I stated in a previous post I would like some commitment to try and finish the project because it is about developing your won work.Ok I need to go explore how I will set up the blog-I am inclined to use blogger , though I know how to use wordpress as well- simply because of the way posts scroll in length rather than as a labyrinth which I find a bit confusing with wordpress.And I am, open to more joining in. Ohh and I have found the perfect place for us to work- a monastery near Urbino in the Marche countryside of Italy, make sure you check out the image gallery- the scenery is wonderful, the lanes perfect for musing( having recently been close to this place- wish I had known!) wouldn't it make a wonderful place for an artist residency and inspiration centre in real life? In my dreams......! And maybe a bucket of gold will fall out of the sky! This is the way my printing screen looked yesterday when I had painted it with the second layer of dye paint/print paste. Unfortunately that is not the way it looked this morning- the overnight dew/condensation got to it despite it being stored undercover- blegh! The darker print is the first print and you cna see it has lost much of its definition. I think I like the second print better- the colouring is much more subtel. I don't know whether you have been following the progress of a group known as Twelve by Twelve- but they have created their own website and blog- doing a themed challenge which is 12 inches by 12 inches on a regular basis. Their first efforts "Dandelion" are up and I must say I am impressed by the variety and inventiveness, and the blog is very colourful! I always like to think I would like to do challenges but in truth I am away so much it is difficult to do at times- and I have enough trouble meeting deadlines for some of the art quilt shows I would like to enter. There are a lot of missed deadlines over the last few years. However I would like to suggest a challenge of sorts if anyone is interested ? ( but there will be a limit of numbers- say 10- and I would like people from all over the world to be involved-after all 135 countries have visited the blog) and that is creating books inspired by your own work ( I have a motive of course because I want to create a catalogue for my exhibition in Munich at Quilt und Textil Kunst next year) but I thought it could also be a way for others to learn book making techniques, bindings , explore their own work/content, some print making, lino cut printing etc. I would envisage that we would share techniques relating to bookmaking etc and links- share a blog ( though I can't promise a website as classy as Brenda Smith has made for the Twelve by Twelve group)- the deadline would be August of next 2008.I am happy to be the the instigator- as I need to do this for myself- by this I mean suggesting things/techmiques etc- though I woulkd like a commitment - though I understand if life gets in the way. 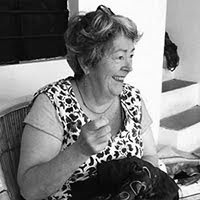 When I was in Europe recently, I went to see a friend, Margo Bimler, a Kiwi living in France- for a few days . She lives in the Haute Savoie in France near Grenoble. The scenery is spectacular- I am sure this is one of the areas where they invented chocolate boxes! And what was even better , despite snow and bad weather the previous few days we had absolutely glorious sunny weather. We had a play with a lot of dyeing and printing techniques ( I don't always get to play as much as I would like as I have to make work to earn my living) and we had a play with breakdown printing which is all the rage at the moment. I must admit I did this technique about 15 years ago with an Aussie called Sharon Muir and it was called polychromatic printing then- and she did it on silk. To be fair the breakdown printing does allow you to do more than one print because of the thickening of the dyes that you paint onto the screen which creates a resist in its own right, but the method is exactly the same. I have even made some backgrounds for some of my very early quilts using the polychromatic system. So it was fun to do again- and really gave me some food for thought. So I have been patiently waiting for fabric and dye to arrive- yes really patiently.....blue and black dye is not enough!But the silk is here! Both cats are sold. They are about 10-11 inches high. I sat and embroidered two of the cats today. I always feel guilty to sit and hand sew- it does not seem like work somehow, so when I do it during the working week I feel as if it is not real work even though some things are much better sewn by hand. The tifaifai was on a whim this morning. We have had something rather disturbing happen in the village- it has all of us reeling and thinking what now and it has a rather unpleasant impact on us. I have been feeling like the cowboy who walks into the bar through those swinging doors but i never get to the bar or to the gun fight because I keep on being hit in the moosh by the swinging door. This feeling always impacts on my work and I can't seem to lift my feet ( or scissors) because they seem leaden- but a thought struck me this morning- back to basics- back to what I know, back to the colours I like and just go. So I cut out this tifaifai without drawing a pattern I just cut it without thinking too much- just cutting- I always like the play of positive and negative and tifaifai is such a wonderful example of how different they are- one is vertical and the negative is horizontal- it makes a big difference as to how they look- they seem like hearts to me- and perhaps that is as it should be - I need to mend my heart.